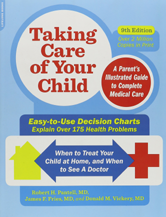 Editor/Author Pantell, Robert H. and Fries, James F.
The award-winning go-to guide that has helped millions of families keep their children healthyânow revised and updated with the most recent advances in health care For more than thirty years, Taking Care of Your Child has been an indispensable resource for parents and caregivers. Covering more than 175 health care problems and symptoms, it offers the most recent information on critical childcare issuesâfrom what to do in the event of a minor injury to everyday issues such as common allergies and ailments. Taking Care of Your Child is easy to use, even in a crisis: you can simply look up a symptom to find a complete explanation of probable causes, how to treat the problem at home, and when to see a doctor. With the very latest on ADHD, autism, breast-feeding, childhood depression and obesity, discipline, immunizations, and more, this new edition also features new sections on youth sports and head trauma, genetic screening, and minimizing risks of medical procedures.